Carsten Tech is a European fintech company, primarily involved in the development of trading platforms and other market-related software solutions. The company is dedicated to provide traders with fast, user-friendly and modern trading tools with easy learning curves. Besides being active in the field of development, our Carsten Tech United States branch is also a licensed data distributor of the Chicago Mercantile Exchange. Finamark is Carsten Tech’s flagship product. This state-of-the-art trading platform combines a fast and reliable trading experience with sleek design and innovative features. The development of the platform was a cooperation of traders, developers and market experts who brought relevant experience from different fields in order to create a product that is ready to take on and surpass established brands. With constant input from experienced traders, Carsten Tech was able to tailor Finamark to suit all the needs of professional traders, while making the platform easy to access for beginners as well. Finamark is easy to learn and offers a wide array of functions. Its widget based layout allows users to customize their trading experience and build their own “trading HQ” - simple and clean for beginners, or complex and comprehensive for the pros. The platform supports multiple accounts, enabling the user to trade both Forex and Futures simultaneously, while the widget-linking function ensures that users are always looking at the data they need. An extensive list of indicators help traders make the best decisions, and frequent tooltips will get anyone up to date in how to use the platform. 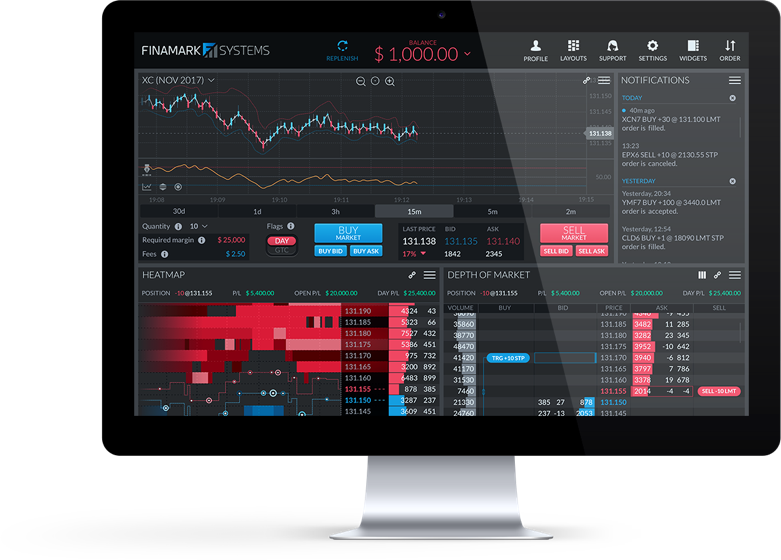 From traders relying on help to expert chartists, Finamark offers a great trading hub for everyone. Carsten Tech would love to hear from you.